Cellular Automata Escapes from the lab! Doesn’t this just freak you out? I’ve actually held a few seashells like this in my own hand and seeing that computer art pattern on such a natural and living thing is just deeply weird. We’ve all seen fractal patterns in broccoli, pine cones and spiral snail shells but for some reason those things just looked natural. I guess fractals patterns are just plain natural looking while cellular automata is quite distinctively artificial and machine made in appearance. Except for these seashells, of course. Some living things use naturally occurring cellular automata in their functioning. 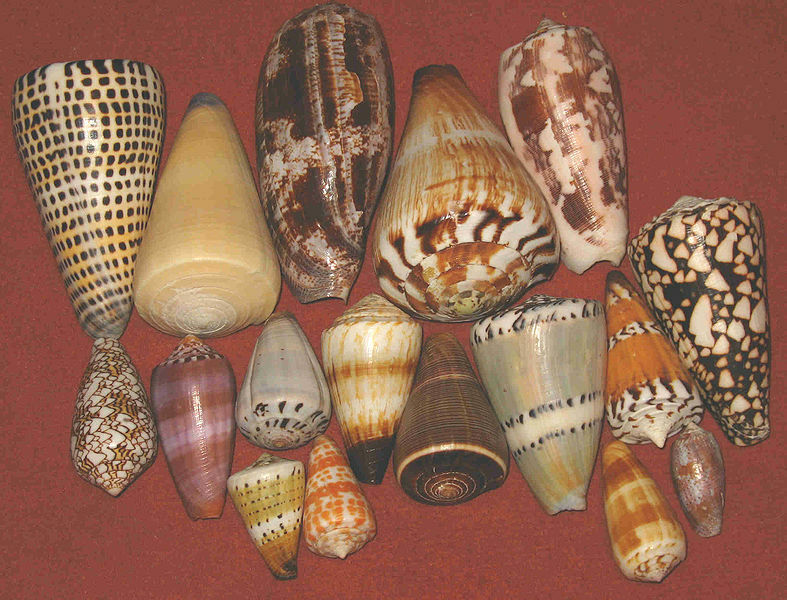 Patterns of some seashells, like the ones in Conus and Cymbiola genus, are generated by natural CA. 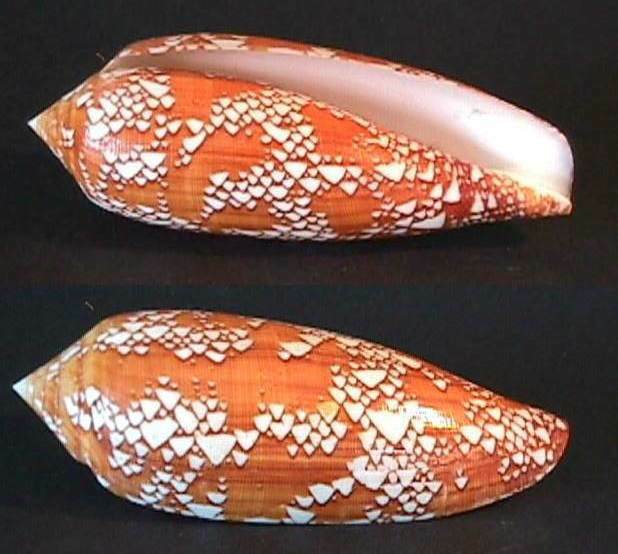 The pigment cells reside in a narrow band along the shell’s lip. Each cell secretes pigments according to the activating and inhibiting activity of its neighbour pigment cells, obeying a natural version of a mathematical rule. The cell band leaves the colored pattern on the shell as it grows slowly. 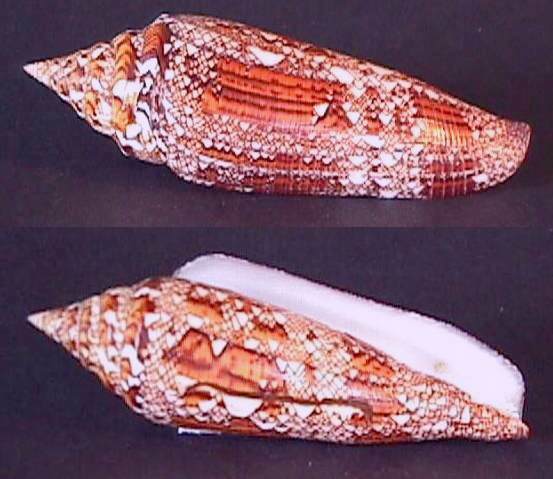 For example, the widespread species Conus textile bears a pattern resembling the Rule 30 CA described above. In addition to Cellular automata, these seashell patterns also remind me of those old dot-matrix printers that back in the old days would have been used to print really cheesy looking graphics (back when ascii art was cutting-edge stuff). But hold that thought for a moment; that’s the way these CA patterns are made: one line at a time. Or rather, one row of cells at a time. The shell pattern is the printout from the row of pigmentation cells and thus the shells display a matrix of dots –dot matrix CA printing. Maybe you have to be as excited as I am about CA patterns to feel the enormity of all this. 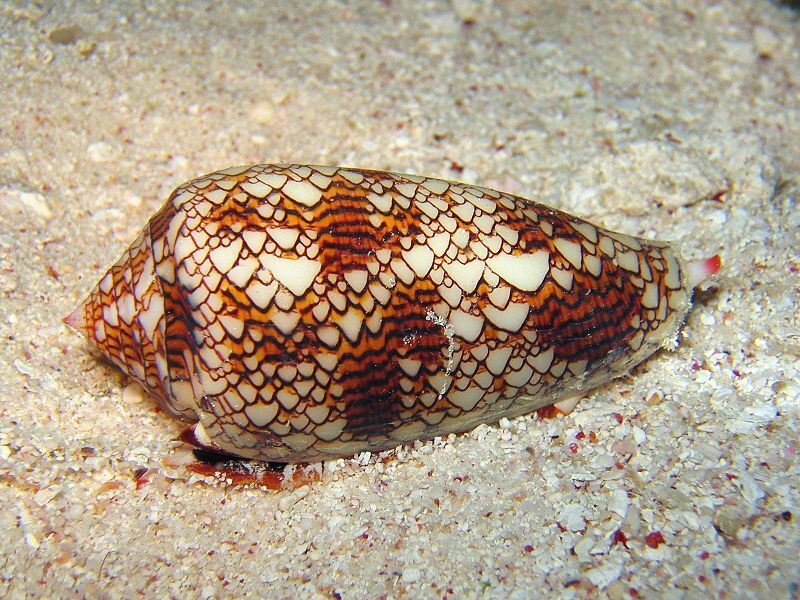 You know, if they ever drop the bomb and civilization as we know it disappears and there’s no more electricity and computers and internet, we can still have computer art galleries made of Cellular Automata from these kinds of seashells. In fact, considering how durable the material they’re “printed” on is, they may be the only kind of computational art around in the distant future. I agree completely, CA is an utterly fascinating topic! It’s awesome when a biological system comes up with something that matches so closely with a simple program. Since this topic excites you so, I highly recommend “A New Kind of Science” by Stephen Wolfram. NKS has some brilliant research behind it, and it is understandable by anyone – not overly technical – which I really like. Unfortunately Wolfram is not particularly humble about his discoveries, there is a note somewhere about a conscious decision to avoid “passive voice” as much as possible. That explains the style, but even knowing that I still think he’s a bit full of himself. Still, you can’t argue with the discoveries he’s made, well worth a read, and you can read it online too. The BMFAC Exhibition Begins? Who Knew?